The drug is manufactured in 0.5 and 1.0 kg composite multilayer bags; 1 kg polymeric buckets. Broad-spectrum action against most of agents of poultry bacterial infections. Does not absorb in systemic blood resulting in absence of toxic effect on liver and kidneys. Contains lactulose (prebiotic promoting beneficial effect on normal intestinal microflora). Long-term shelf life without special storage conditions. 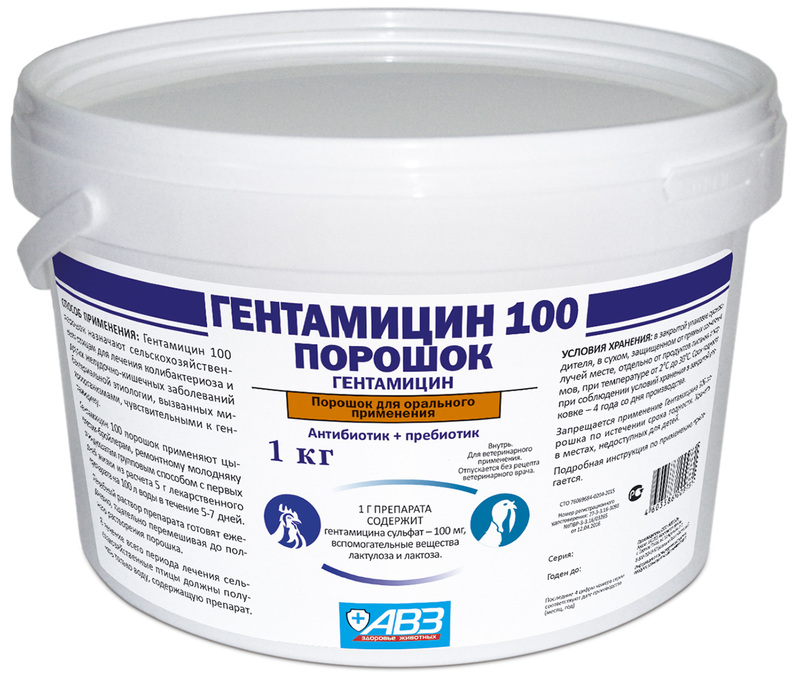 1 g of Hentamicin 100 powder contains 100 mg of gentamicin sulfate, as well as excipients (lactulose and lactose). It is an antibacterial drug (aminoglycoside antibiotic) with a broad-spectrum antibacterial effect. After oral administration gentamicin sulfate slightly absorbs in gastrointestinal tract providing intestinal action. It is excreted unchanged, mainly, in feces. 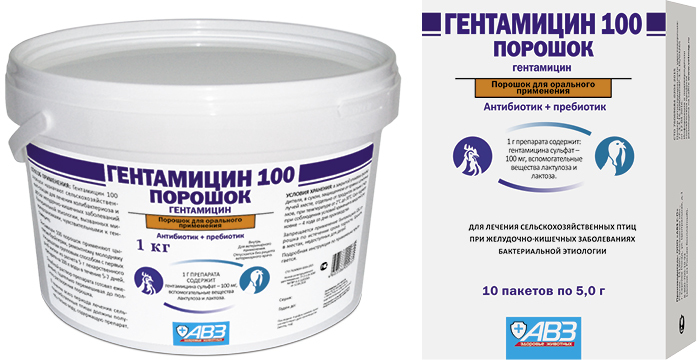 Use Hentamicin 100 powder to treat poultry colibacillosis, salmonellosis and other bacterial gastrointestinal infections caused by microorganisms susceptible to gentamicin. Increased individual sensitivity to the drug components. Do not use in laying hens and henny replacements (less than 14 days before egg-laying starts) due to gentamicin accumulation in eggs. 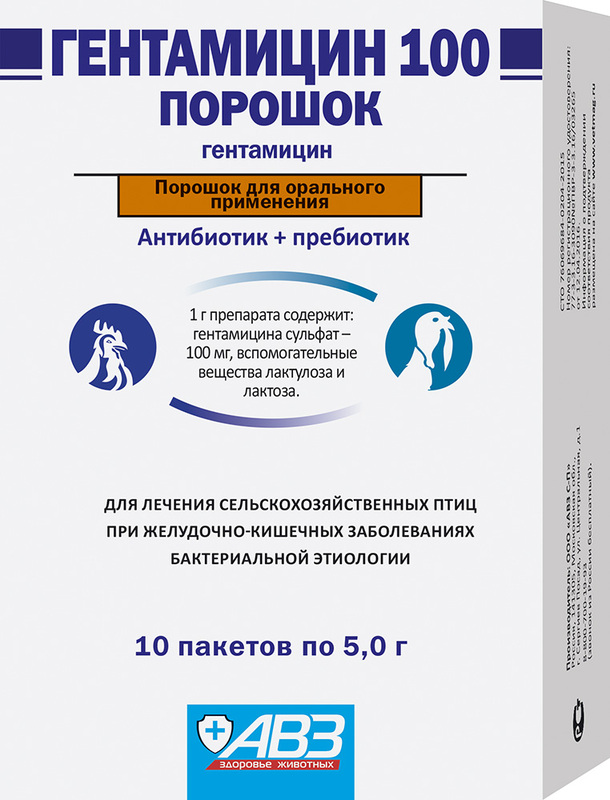 Simultaneous or successive use with other oto- or nephrotoxic drugs (streptomycin, kanamycin, apramycin and neomycin) is not allowed. Broiler chickens, henny replacements and poults: group administration since first days in dose of 5 g of the drug per 100 l of water within 5-7 days. Prepare medical solution every day. Accurately mix until the powder dissolves completely. Only water with the drug is allowed to be consumed during treatment. Stop drug administration in case of increased individual sensitivity to the drug components and allergic reactions. Perform desensitizing therapy. Overdose symptoms: hearing disorder and vestibular apparatus activity impairment. Poultry are allowed to be slaughtered for meat not earlier than 3 days after the last drug administration. Store at 2-30°С. Shelf life is 5 years from manufacturing date when stored in accordance with regulations.